This Muse is so bright, you gotta wear shades! No one can look at this card and not smile - those big blossoms in bright colours are just jumping off your screen, right? We can't wait to see where this week's Muse will take you! The InLinkz will close and voting will begin at 12 noon EST on Saturday. Please don't forget to come back and vote for 3 of your fellow member's submissions. Voting ends on Sunday at 12 noon EST. The results of voting will be announced at 8:59 a.m. EST and our new challenge will begin at 9:00 a.m. EST on Monday. Another really beautiful Muse to inspire our creativity! I love the pretty spring flowers and all the lovely colors...thank you, Marion! This design has a Pennsylvania Dutch look to it, something we used to paint eons ago. Love the bright bold colors on this card! Great card, Marion. Love the colours. I'm looking forward to joining in this week. 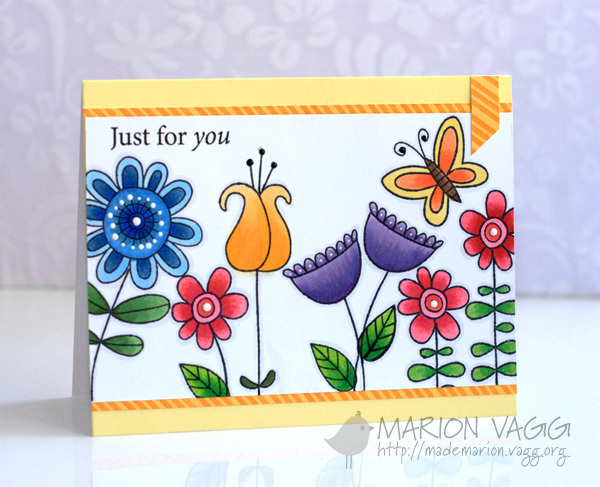 This is really a fun,fun card....Love the colors, flowers, etc. This was really fun, but boy was it a hard decision to VOTE this week. There are so many amazing cards....! Good Luck to all! !